On screen, the legendary German actor Klaus Kinski (18 October 1926 - 23 November 1991) was best known for his collaborations with director Werner Herzog, including the classics Aguirre, Wrath of God (1972), Nosferatu the Vampyre (1979) and Fitzcarraldo (1982), a trilogy which pushed performance to the brink of all-consuming madness. In real life, Kinski was often equally electrifying. According to Peter Geyer, head of Kinski Productions, which manages the actor’s legacy, his name came to stand for “leadership in extravagantly non-conformist thought,” a polite way of describing a man whose hell-raising scandalized even his most free-thinking peers. How do you go about creating a fragrance to capture the character of such a complicated man? Geyer took on that challenge to mark the 20th anniversary of Kinski’s death. He wasn’t interested in simply merchandising the actor’s name. Nor did he want any gimmicky association with the idea of “smelling like KIaus Kinski”. Instead, he wanted a luxury product that would convey a rare, precious, arcane personality. So he sought out Berlin-based perfumer Geza Schoen, who has earned a worldwide reputation for precisely those qualities with the Escentric Molecules range of fragrances. 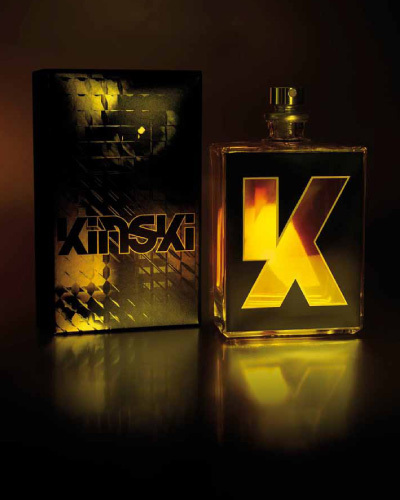 Kinski Productions has licensed the team behind Escentric – Schoen, Jeff Lounds, Me Company – to shepherd KINSKI the fragrance into being. The “portfolio” Schoen is referring to is the six members of the Escentric family, plus A Beautiful Mind, the new series he is working on with Lounds and Me Company. With each of those products, their appearance has been an integral part of their appeal because of Me Company’s haunting design work. KINSKI is no exception. “Kinski was partly famous for his manic eyes, the staring eyes of the true outsider,” says Me Co.’s Paul White. “I found a black-and-white image of Kinski as a young man, possibly a passport photo from the late 40s, but with that same mesmerizing gaze. But for me to be able to use this image, I had to ﬁnd a way to bridge an old photograph and a contemporary fragrance.” In a masterful marriage of shadowy ﬁlm noir mood and contemporary experimental method, White cropped the original image to the eyes, distorted it with a custom-built virtual 3-D screen, and glazed it with gold. The result is an expressionistic rendering of the actor’s face, splintered and ﬁltered through the decadent 70s, the decade when Kinski’s life and art combined to create the cult-ish magic that still grips audiences today. Geyer is thrilled with KINSKI the fragrance, and he is convinced Kinski the man would have been too. “He would have loved to be used as a luxury brand,” says Geyer. “Plus, he was addicted to the idea of using perfumes long before the male perfume market went mainstream in the late 80s. He probably changed his perfume at least as often as he changed his luxury cars.” For the record, there were three years at the end of the Sixties when Kinski bought 16 cars: three Maserati, seven Ferraris and six Rolls Royces. That’s a whole lot of perfume. But maybe if he’d encountered Schoen’s creation in his honour, his restless soul might have been temporarily stilled and seduced by a different kind of self-indulgence. That is certainly the invitation that Geza Schoen is offering the rest of us. Fantastic, you've been signed up to our newsletter. You can look forward to receiving the latest news on our product releases and updates from Kinski and those of our sister brands, Escentric Molecules, The Beautiful Mind Series and Boudicca Wode.